This week at PopMatters, I talk about one of the best games I've played all year: The Swapper. I tend to agree with Dan Teasdale's recent thoughts on the overabundance of sci-fi in video games, but I think The Swapper shows just how useful the genre can be when it's used for more than simple set dressing. There's no doubt that instant-cloning and swapping consciousnesses are squarely in the realm of fantasy, but The Swapper grounds them with just enough seriousness that they can be used as tools. The result is a game that is a great exploration of morality and individuality. These sci-fi tropes also make for some excellent puzzles. One thing I didn't get a chance to touch on the article was the game's art style. It actually reminds me of stop-motion animation: things are textured photorealistically, but the proportions and even the items themselves are stylized and fantastical. The shuttle pod looks like a tin can and some of the environments seem like they could be made of cardboard (in a good way). All these materials and shapes offer just enough familiarity to be recognizable but also unnerving. There's just something "off" about the way things feel. Where LittleBigPlanet used the same techniques to effect warmth and playfulness, The Swapper uses them to transmit uncertainty and alienness. The Swapper doesn't take dozens of hours or require elaborate set pieces to get its point across. Combat is nonexistent, yet the game is both challenging and suspenseful. It puts sci-fi themes to excellent narrative and systematic uses, which shows that perhaps the misuse, rather than overuse, of genre conventions is the actual problem with the gaming landscape. 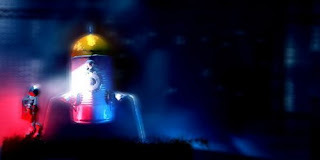 After all, if all sci-fi themed games were as thoughtful as The Swapper, I don't think we'd have much to complain about.